Understated glamour that can be worn day or night, the Victorian Inspired Swiss Coin Pendant with Glass Pearls has a classic look of the late 1800s. 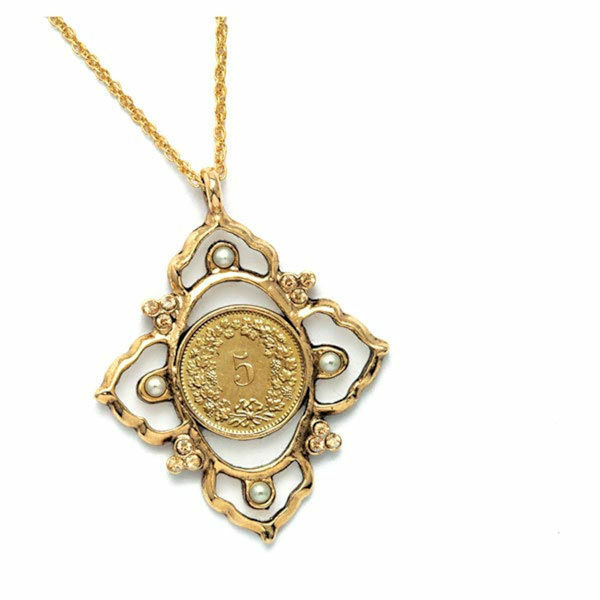 The open gold tone pendant is simple yet elegant in shape offering 4 glass pearls and 4 clusters of crystals for a symmetrical design. The Swiss coin is a 5 Rappen showing the reverse of an edelweiss wreath and the numeral 5 and is composed of copper and nickel. The pendant hangs from a gold tone 21 inch chain with a lobster claw clasp. A Certificate of Authenticity is included. Allow 2-3 weeks for delivery. No rush delivery or gift box. Item can only be shipped within the Continental US.